bet-at-home Sports is a household name when it comes to online sportsbooks, having joined the industry in 1999 and launching the site one year later. It combines great betting options with big bonuses, which is in stark contrast with other online sportsbooks that offer minimal bonus and promo incentives. 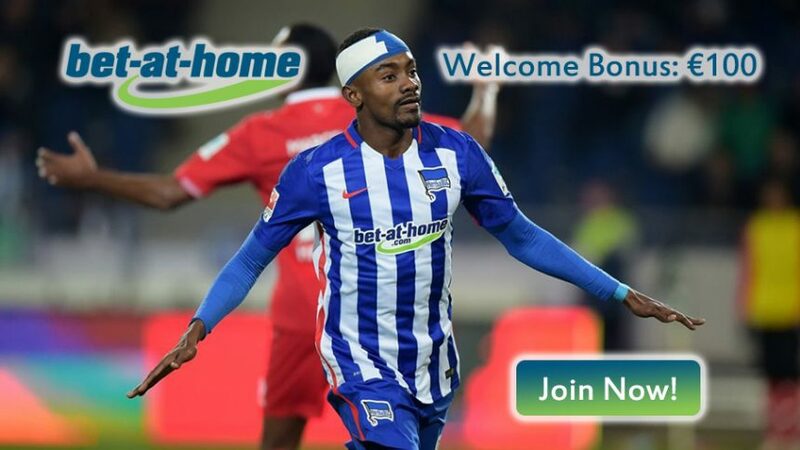 Create an account with bet-at-home Sports and grab yourself the big €100 free bet Welcome Bonus! Your first deposit will bring 50% match bonus up to €100. We’ve said it before, and we’ll say it again: other online sportsbooks give their new customers small bonuses that consist of €20, €30, while bet-at-home Sports on the other hand gives out five times that amount as soon as you join! And that’s not all. bet-at-home Sports has four different promo offers that can see you scoop betting vouchers and other amazing rewards. With the Winner of the Day promo you can win a few hundred Euros just by opting in, while if you send bet-at-home Sports an SMS from your phone, you can collect a betting voucher worth €60 on a daily basis. We strongly advise you to participate in the Betmastercup promo, as the first place prize consists of €500 in vouchers, with the other two places netting you (2nd) €300 and (3rd) €200! Whenever you’re betting on big football (soccer) match, make sure to insure your wagers with the 0:0 Cashback Bonus in case the match ends in a goalless draw – this allows you to collect up to €50! But the best promo of them all is the Bet-Cup; you can win a new, super-fast and super-cool Porsche 911 that’s worth a whopping €100,000! This alone should be enough to convince you to join bet-at-home Sports, otherwise we’re afraid that you’re not a real sports betting fan. The most special and out-of-the-ordinary market is “Society.” This sports market allows you to place wagers on events like: Human mission to Mars, Extra-terrestrial life, Lewandowski an alien and Faymann Special. We’re not sure that any other online sportsbook has such special offers, which makes bet-at-home Sports one of the most unique for this very reason. The depositing systems and currency options are abundant, so there’s no need to worry whether you’ll be able to transfer your money in time for the next sports event. If you’re constantly in a hurry, we suggest you play bet-at-home Sports on your mobile. This will alert you to special offers and all the latest sports events taking place, so you’ll never have to miss a chance to win big again! Besides bet-at-home Sports Review, check out our other online sportsbook reviews to discover other popular online gambling destinations. Take a look at the detailed online betting guides and online sportsbook bonuses for winners! You can also follow the latest online sportsbook bonuses and online betting promotions on Twitter and Facebook.